Happy Mother’s Day to all of you beautiful and loving mothers that are stopping by A Spotted Pony today! I wanted to share a little story with you about the best part of being a mother and how my children have taught me the most important life lessons. I hope you enjoy it! Being a Mother is by far the most amazing gift in my life. I have changed so much since having children and have learned so many important life lessons. Our little family has faced many difficult times since our children have arrived, but somehow our strength as a family unit and our faith has been only strengthened and magnified. I always thought that I new what being really tired felt like, being heartbroken felt like, and what pure exhaustion, and patience was. Well not at all actually, I was way off. Those two beautiful babies quickly turned life upside down and completely changed the way that I lived mine. It’s funny how quickly things change with the presence of a newborn in ones home, and how the things that you used to think were important quickly fade into memories. Yes, children change things, but in the most surprising and amazing way. Each and every day spent with my children is a precious gift to me. I am so honored to be able to be called “mom” by them, and wouldn’t change one messy, noisy, exhausting second of it. Things rarely go as planned these days, and most days test my patience and ability to thrive in the chaos. But, through that chaos my kids continually remind me what is really important. Last week started out like any other. The normal off to school, laundry, make three meals, clean up three meals kind of a week. Then on Thursday night into Friday morning we got some really bad storms. The storms followed a good amount of rainfall in our area for the week already. The night was long with the kids each taking turns coming into our room to sleep because of the thunder and lightning. No big deal, it’s pretty normal for any parent with little ones to not get a good nights rest if there is a storm. Then, the hubby and I woke about a little before 6 am. He was to leave at 3 am, but the power must have gone out a few times at night leaving him 3 hours behind schedule. So he rushed to get ready, and as he walked out the door I said “Hun, I hear water running!” Sure enough I opened the basement door to see our basement filled with about two inches of water. He shrugged his shoulders and sadly had no choice but to leave for work. We talked on the phone and made a game plan that was not ideal, but would have to do. As the kids strolled grumpily out of bad after a bad nights rest, I noticed my daughter had horribly red eyes, and she was crying because she couldn’t open them. So, in a rush I got my son ready for school, and reluctantly called to make a Doctors appointment for my daughter. All I could think of was the water sitting in our basement ruining everything and that I wasn’t doing a thing about it. I just needed to let it sit until after my daughter got into the doctor. Through the pouring rain, and terrible storms that day I dropped off overdue library books, , ran necessary errands, and got the word from the Doctor that my little girl had pink eye. Ugh, really? Why, how, today? So we ran out of the Doctor’s office and arrived at the bus stop just barely making it back in time to pick my son up from school. We headed to the pharmacy for medicine where I waited with two very crabby and hungry kids for a prescription. My patience was also wearing thin between phone calls from the hubby about the water situation that I hadn’t had time to do anything about, a lack of sleep for myself, and a three year old who wasn’t feeling her best. We finally made it home for lunch and I put the kids down for a nap. I spent the next two hours hauling dripping wet linens, blankets, and toys up from the basement. I did load after load of laundry. I moved as much furniture as I could by myself and did the best I could. I knew it was no place for the kids to be, and their nap time was my only chance to work on cleaning up the mess. The kids woke up and I reluctantly stopped rescuing things from the basement. The clouds were gone by this point and the sun was gloriously shinning in the afternoon sky. We made and ate dinner and then went outside to do some barn chores. The kids put on their galoshes and happily strutted to the barn with me. Of course their day had been perfectly normal except for the pink eye, and all was well with the world. That was a feeling that I could have used that day, but just couldn’t muster it. I was cleaning stalls when my son came over to me and said, “Mom, you have got to see this, my sister is being really cute and funny!” Well this I had to see! Those weren’t words that I was used to hearing from his mouth at all! I looked over on the hill to see her giggling and running with delight. 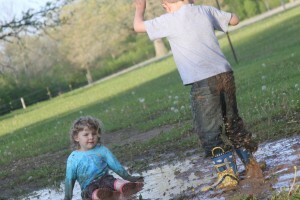 That sweet little girl had found a big puddle and turned a little puddle jumping into a huge mud pit. 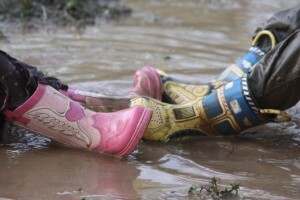 She was wearing some little silky starred pajama bottoms and her pink galoshes, just splashing and jumping in the mud. She was covered from head to toe. 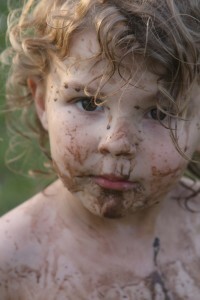 I could see her sweet little white smile shinning through the mud caked on her face. My mind stopped racing from the days events and I couldn’t help but smile and ask her what she was doing? She looked back at me and said “I’m having fun… come on Mom!”, as she waved her little hand to coax me into the mud. The sight of her little pink galoshes, pink nail polish, and shiny pants plopped in the mud puddle made me pause from the troubles of the day and just be happy. My son looked at me with that “can I” face and I instantly nodded, “Go for it buddy”! I ran off to get my camera, thinking I never wanted to forget those sweet smiles they had on their faces. 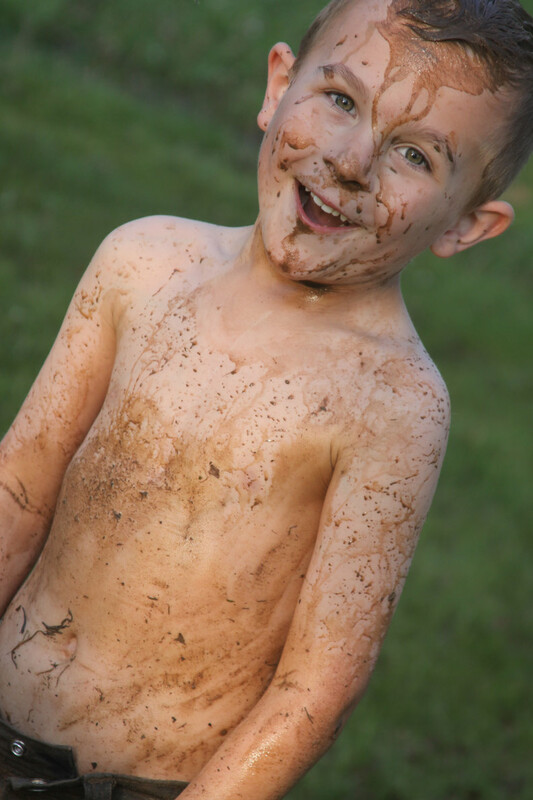 By the time I got back both kids were covered in mud, running, playing, and laughing like I had never seen. There was no fighting, no complaining, no arguing. Just the sound of pure childhood joy. They were holding hands and jumping together in the mud for a good two hours. A perfect sight to any Mommy’s eyes. I sat the entire time snapping pictures of the fun and enjoying the simple splendor of my happy kids. Yes, I had things I should have been doing, a lot of them, but they could wait! and to stop and enjoy the moment while it was happening. We often get so busy with our lists of things that need to be done, work, school, house work, obligations, but these are the moments, and we need to cherish them. I already know that I will miss these moments so dearly as my years wear on. What a great lesson that my kids allowed me to see that day. If not for them I would have busily gone through the day frustrated, and trying to get it all done without an ounce of joy in my actions. My kids saw the simple joys in a rainy yucky day! I had spent all morning grumbling about the things that were ruined, the time I didn’t have, and letting the stress that I felt ruin my day. Becoming a parent always changes a person. You become more responsible, more worried about others than yourself, and defiantly takes a toll on your energy level. But becoming a parent really teaches you how to be a kid all over again and how to enjoy life through the innocent eyes of a child. It makes you realize it’s wonders all over again. I wish as adults, that we could all think like that from time to time. Let me tell you, it is sure a whole lot more fun that way! As the mud stopped flying the kids found a new puddle (more like a stream) that was more water than mud and began round two of the fun. They spent another hour racing through the knee high water with vengeance. Before I new it, they had convinced me that I needed to join them, and well …I sure did. I put down the camera, took of my shoes, and held their hands as we raced through the water together. 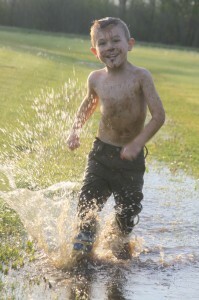 It was exhilarating, and as much fun as I remember from my own childhood playing in the rain. My husband arrived home after a long, 16ish hour day, of work and had nothing but a smile on his face at the site of his whole family drenched, barefoot, and smiling in the yard. It was at that point that I realized the significance of that day for our family, and hope that I will never forget it. My husband and I knew that as soon as the kids were in bed that we would spend the entire night in the basement, mopping, cleaning, vacuuming, and salvaging what we could in the basement, but it really didn’t matter one bit. What’s one nights sleep in comparison to a lifetime together as a family. Together, we would figure it out, and hold each others hands and something that we really didn’t want to do. We got the kids all showered and tucked into bed and spent the rest of the night in the dark wet basement sweating as we vacuumed up the water and moving things around. We managed to smile at each other and have a few laughs as we threw things away, and made the best of our only time together for the day. I watched him in awe as he exerted every ounce of energy that he probably had left for the day. Never once did he complain or even udder any kind of complaint about we spent our evening. I wish I could be more like him in that sense instead of panicking and “freaking” out when things go wrong! I am always impressed with his ability to handle things that don’t go right so well. Our heads didn’t hit our own pillows until well after 2:00 in the morning, and you know what, I had a huge smile on my face as I thought about our day. Thank God we had each other and that he gave us that day to be together. Thank God for an amazing husband who graciously works and works and works without a complaint. Thank God for two beautiful kids who remind me to stop and enjoy life. Thank God for the mud, and the fun, and the rain, and for all of it, good or bad, because without it all, life wouldn’t be worth the dance. I was proud of how well our little family managed to hold it together on a “bad” day, and that we managed to dance in the rain even though we really didn’t have time to. The things that I have gathered from my own children are, by far the greatest and most powerful lessons I have learned. Oh Kim this is so beautiful – it brought tears to my eyes! I loved it so much. What an awesome lesson to learn from the kids, and good for you for seeing it! You forget to mention in here what an amazing woman and mother you are. I know it’s not like you to ever toot your own horn, so I’m doing it for you! I never would have guessed what a terrible day you were having when I saw you at the pharmacy! You truly go about life with a radiance and inner joy that is contagious. No wonder you have such awesome kids! Even though I’m sure the pharmacy was the last place you wanted to be, seeing you and the kids brightened my whole day! You’re kids are just as blessed to have you as you are blessed to have them! Aww, Bailey what a sweet comment! Thank you so much for the kind words. Coming from you, they are especially meaningful and really touch my heart! I’m lucky to have such a kind and caring friend like you! I’m so glad that we can brighten your day even when we are a mess 😉 I meant to message you that afternoon and tell you how much I appreciated how quickly you guys filled my prescription that day!! The whole staff there was so nice and quick too! Thank you so much for your kind comment! It touches my heart to know that other mothers can see and understand exactly what I mean in their own children’s eyes! Their precious little lives are truly God’s greatest gift to adults in so many ways! They grow so quickly, and change so fast I just cannot imagine not relishing every last second while they are little! Thank you for reading my story, and for taking the time to leave such a wonderful comment, it made my day. Enjoy that sweet little boy of yours – I’m sure he has changed your heart in so many ways! I’m glad you are blessed to be home with him and enjoy all of the little things that day to day life has to offer with him!